The relationship between geometry and art will be examined using the example of pentagonal structures. The work of contemporary Dutch artist Gerard Caris is based on those pentagonal structures. He calls his art work Pentagonism and questions how art creations and design processes can rely on strong, geometric, structural thinking. Pentagonal structures in plane as well as in space will be analyzed from a geometrical point of view and compared to corresponding art approaches. A review of geometric research on tessellations will be followed by a discussion on previous attempts to tile the Pentagrid with regular pentagons. The fundamental role of the Pentagrid and derivable Kite-Dart-Grid in Caris’ art design processes will also be explained. 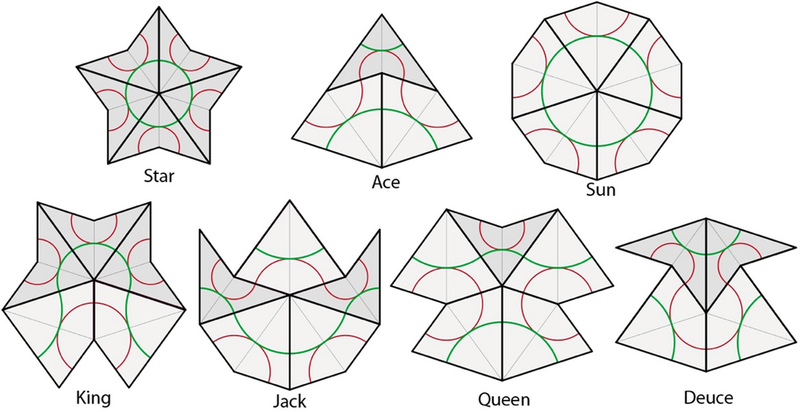 A step into the three-dimensional space leads to the dodecahedron and derived rhombohedra configurations for tessellations, or packings, in space. The geometric background refers to fundamental works by Plato, Euclid, Dürer, and Kepler as well as recent research results. The investigation will end with a discussion of the aesthetic categories of redundancy and innovation, their application to art evaluation and the differentiation of geometry and art. 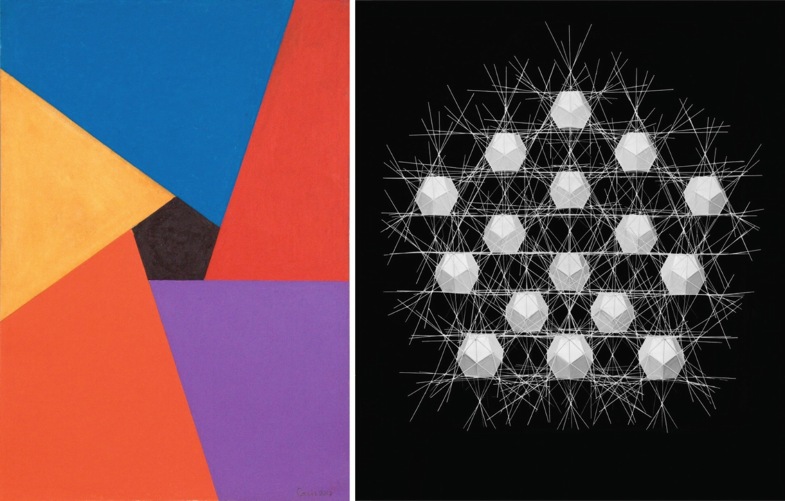 The example of Caris’ art, which concentrates on the regular pentagon and the spatial counterpart dodecahedron, points out the possibilities of aesthetic expressions on the basis of geometric structures. Art enables the exploration of those structures in a playful and self-explanatory way and often precedes scientific research. Such principles of order as an aesthetic foundation of art can be found in the geometry of tessellations, patterns, and its spatial variants. This corresponds to the statement of Paul Valéry (1895) that patterns and ornaments are fundamental to art. He compared the role of the ornamental drawing in art with the role of mathematics in the sciences. This fundamental role can be also confirmed by the appearance of geometric patterns in various traditions of ethnic handicrafts found in transcultural studies. By studying the art of Gerard Caris (Leopold 2016, 2018) in its developments, it is possible to follow the process from an early stage of geometrically ordered structures to the later stage of aesthetic expressions. His concentration on the regular pentagon and its spatial counterpart, the dodecahedron, allows him to explore manifold pentagonal structures in plane as well as in space. Caris calls his art “Pentagonism” (Jansen and Weibel 2007). The suffix “-ism” denotes a condition or system; thus, the word describes his art as a system based on the pentagon. The following sections discuss this pentagonal system, its geometric foundations, and the received art creations stimulated by those structural considerations. There are three possible tessellations that can be formed with regular polygons: triangle, square, and hexagon. These three regular tessellations, or Platonian tessellations, are followed by eight semiregular or Archimedean tessellations. Archimedean tessellations are characterized by two or more convex regular polygons for which the same polygons in the same order surround each polygonal vertex. With the help of the mighty tool of dualization, the center of each polygon as a vertex can be joined to the centers of adjacent polygons in order to form dual tessellations (Weisstein). The number of lines in one point (vertex) produces the number of vertexes in the resulting polygon (Fig. 1). 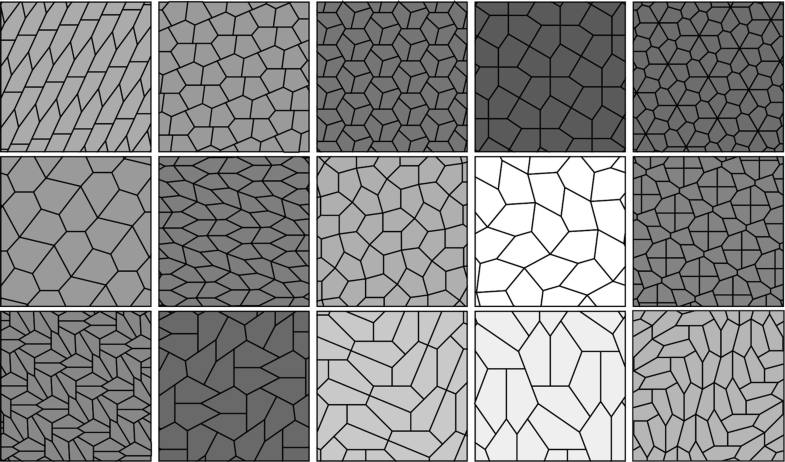 The result of the dualization of a semiregular tessellation is a dual tessellation with one type of nonregular polygon instead of regular polygons. One example is the so-called “Cairo Tiling” (MacMahon 1921), which is the result of the dualization of the semiregular tiling of three regular triangles and two squares. This is characterized by 3-3-4-3-4, or the sequence of triangles and squares in each vertex. Mathematical research on pentagonal tiling later continued. Casey Mann, Jennifer McLoud, and David Von Derau discovered a 15th monohedral tiling convex pentagon in 2015 (Pöppe 2015). In July 2017, Michaël Rao (2017) completed a computer-assisted proof showing that there are no other types of convex pentagons that can tile the plane (Fig. 2). The artist Caris started with an intuitively perceived irregular pentagon in his works “Birth of Forms” (Fig. 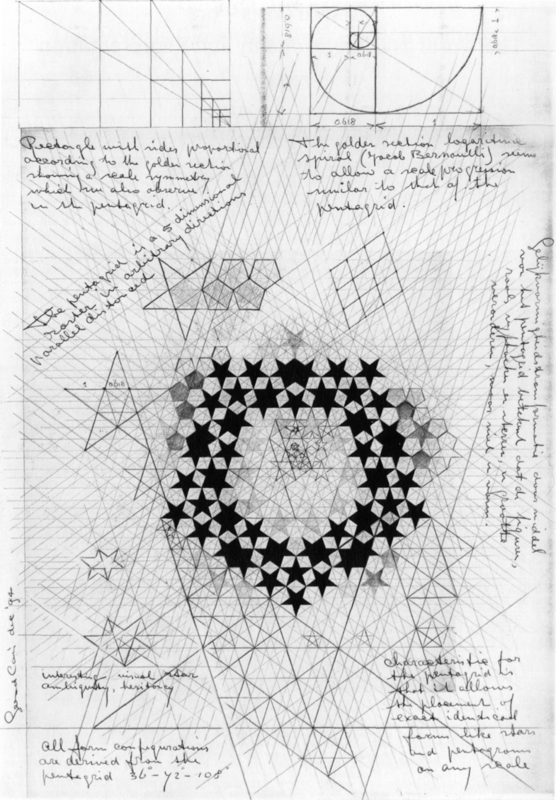 3, left) and “Creation of the Pentagon.” For Caris, these works answered the question: “How to imagine something from nothing?” These spontaneous compositions were his keyworks. Pentagons are not obvious in these works, but they can be derived by connecting their vertices, extending and adding lines. The configuration in Fig. 3 is reminiscent of an overhand knot created with using a paper strip (Fig. 3, right). This astonishing fact shows the self-evident occurrence of the pentagon, which was not considered at that time by the artist. Early attempts to tile the plane with regular pentagons were unsuccessful. Rhomboidal gaps nevertheless remained between pentagons and could be placed at various positions. Figure 5 shows three examples of Caris’ work and the aesthetic results he discovered from those variations. The use of bright-dark colors supports spatial interpretations of the works, which he continues in his later reliefs. Such studies on tiling with regular pentagons have been conducted by Albrecht Dürer (1525, pp. 66–69) and Johannes Kepler (1619, p. 77), as shown in Fig. 6. It is interesting to see that Kepler had tried to achieve a subdivision of the pentagon, though Caris is able to more thoroughly explore the complex structures that arise from the pentagonal tiling in their aesthetic variations. 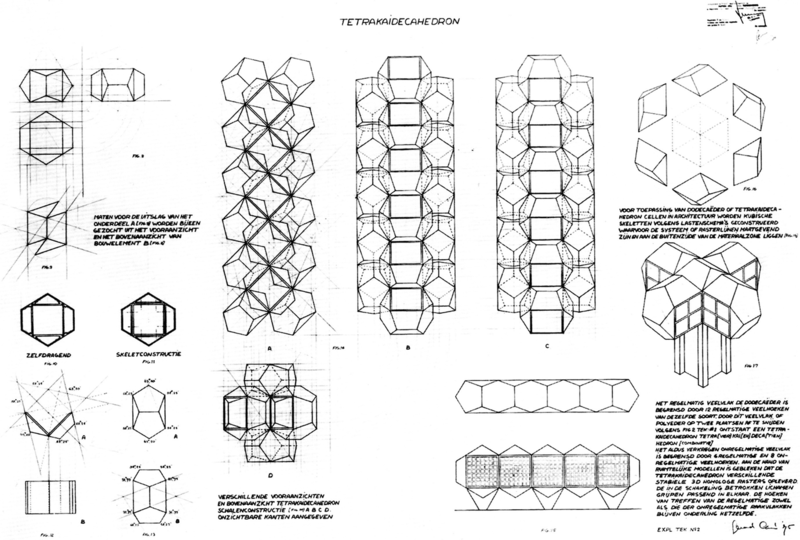 In recent times, mathematical studies on pentagon packings in order to find the closest pentagon packing have been conducted by Greg Kuperberg and Włodzimierz Kuperberg (1990) based on double-lattice packings (Fig. 7). Caris’ artistic style is mainly interested in the pentagon as a systematic fundament for his creations. 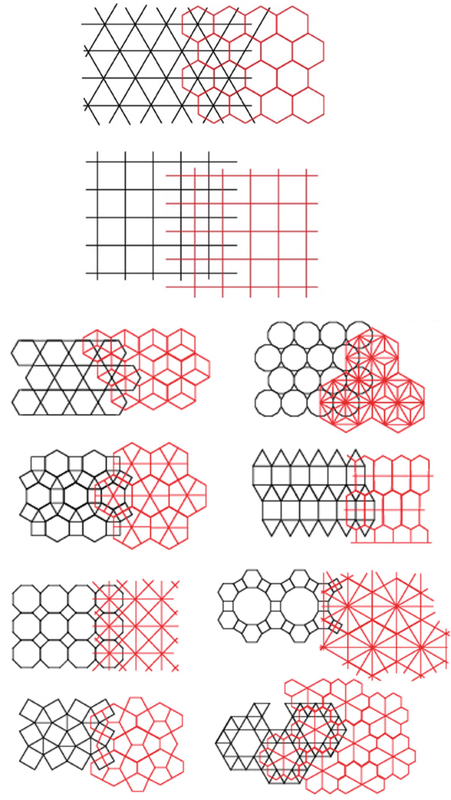 Explorations in tiling with regular pentagons led Caris to develop the Pentagrid (Fig. 8), which became the structural basis for his art works in the plane. It contains manifold relationships and configurations from the pentagon and forms and is thus the repertoire for all potentially derivable art works. The Pentagrid reflects the pentagonal system. Caris describes the Pentagrid as a grid with five degrees of freedom. The five lines in one node form its basic structure (Fig. 9, left). The regular pentagon has a side-to-diagonal relationship that follows the golden section; therefore, the grid has angles of 36° and 72°, and their sum, 108°, is the magnitude of the interior angle of the pentagon. The two possible golden triangles are part of the pentagon. An infinite continuation of subdivision according to the golden section would result in fractal structures of the Pentagrid. In this way, the Pentagrid explains the structures depicted in Fig. 9: the pentagram, golden triangles, and two kind of rhombuses (one of them is divided by the grid lines in kite and dart figures) (Fig. 9, right). Pentagonal structures in the Pentagrid are the basis for various painting series by Caris such as Structure, PC (Pentagon Complex), and ETX (Eutactic Star Series). During a visit to his atelier, it was interesting to see that he used the Pentagrid on his drawing table during the creation process. Figure 10 shows some diverse examples from Caris’ creation period. Possible spatial interpretations become increasingly more obvious. In the ETX, Caris refers to the concept of vectors forming a star, which is called well-arranged, or eutactic, if the orthogonal projection from a higher-dimensional space is placed onto a subspace (Coxeter 1951). In this case, the projection moves from the three-dimensional space into the two-dimensional space. This background can explain spatial interpretations of two-dimensional works. Patterns have been especially developed in the tradition of Islamic ornaments. In the ninth century, references to patterns based on the golden section had already been made, in addition to root two and three proportional patterns. Figure 11 illustrates how an Islamic ornament can be constructed from the regular pentagon according the elementary studies of El-Said and Parman (1976). By overlaying two pentagons that have been rotated by 180°, the decagon is created, and the ornament is further developed (Ghyka 1977, p. 34). Two works of Caris (Fig. 11, right) related to these ornaments were also developed out of the Pentagrid. Kites and darts are present within the two rhombuses that form the structure of the Pentagrid (see Fig. 9, right). They form the basis for the quasiperiodic tilings, also known as Penrose tiling, found by Robert Ammann and Roger Penrose in the 1970s. In 1971, Caris showed that kites and darts are part of the Pentagrid, and he derived the Kite-Dart-Grid from it (Fig. 12). There are seven ways to arrange kites and darts around a node. Conway and Lagarias (1990) called them the Star, Ace, Sun, King, Jack, Queen and Deuce (Fig. 13). Each kite and dart is composed of two golden triangles, also called Robinson triangles (Grünbaum and Shephard 1987), which are marked in Fig. 13. Caris worked extensively on the arrangements of kites and darts, especially in his Kites and Dart series 2015–2017 (Fig. 14). In these works, Caris creates figurative works from the arrangement of the kites and darts, symmetrical or asymmetrical, and reveals the golden triangles by coloring them. In a new work of 2017, he returns to the original figure, the regular pentagon, with the help of the kite and dart configurations (Fig. 14, right). In this way, the circle of his substantial pentagon studies closes again. 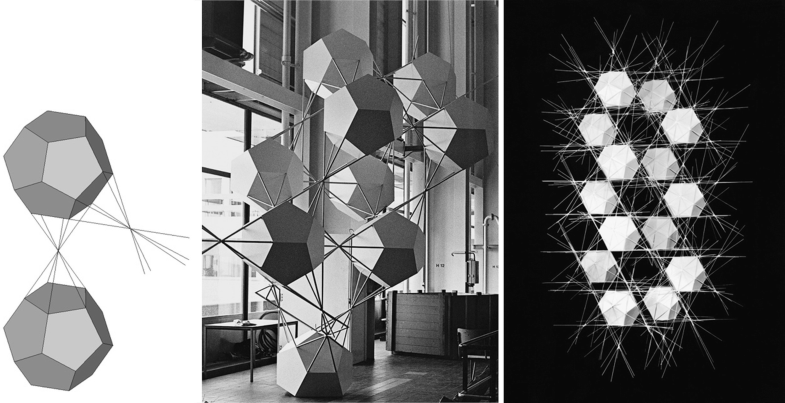 During his working process, Caris created spatial pentagonal structures in parallel to those in plane. Twelve regular pentagons form the dodecahedron, which is one of the five Platonic solids. The Platonic solids are built using congruent regular polygons so that the same number of polygons abut each vertex. This condition leads to five regular polyhedra. 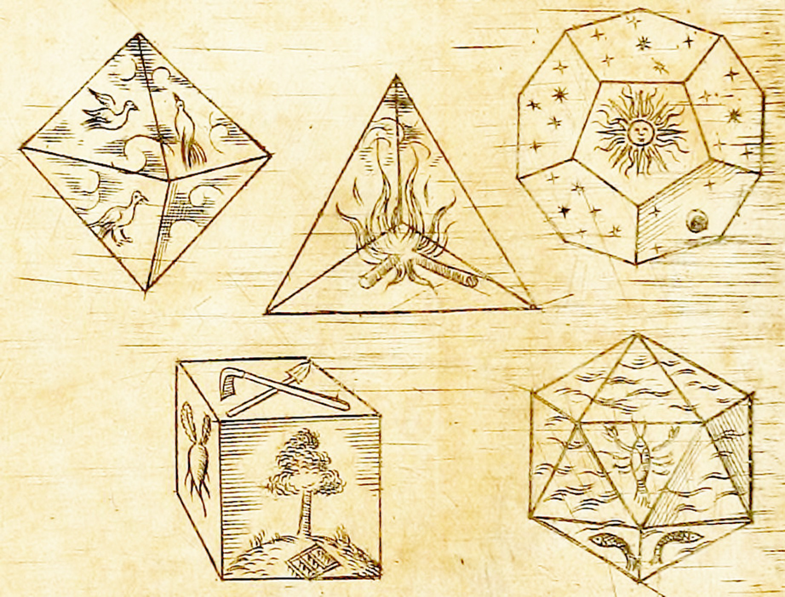 Plato mentioned these polyhedra in his dialogue Timaeus and assigned each a cosmological meaning: cube (hexahedron) – earth, tetrahedron – fire, octahedron – air, icosahedron – water, and dodecahedron – universe. About the dodecahedron, Plato remarked, “There was yet a fifth combination which God used in the delineation of the universe” (Plato 360 BC, Timaeus 55c). Kepler illustrated the Platonic solids with these assignments in his Harmonices Mundi (Kepler 1619, p. 80) (Fig. 15). Finally, Euclid proved that there were only these five regular convex polyhedral. He described the properties of the Platonic solids and their construction. In searching for regular tessellations of space via tessellations in the plane, regular tessellations of space were found only to be possible for cubes. This may be the reason for the dominance of the orthogonal structures in the built environment. Caris looked to pentagonal structures as a new system of order to establish a pentagonal universe of art in the hopes of escaping overwhelming orthogonality. He started to arrange spatial configurations with dodecahedra, for example, by extending the edges of the dodecahedron. The result was a spatial dodecahedra grid. These attempts, along with other criteria for the distances, led to sculptures of Caris like Monumental Polyhedral Net Structure (Fig. 16). He also experimented with spatial packings of dodecahedra in accordance with the tessellation attempts of pentagons in plane. The resulting sculptures and reliefs (Fig. 17) show various gaps between the dodecahedra dependent of the kind of packing, or configurations, with dodecahedra. Euclid focused in his Elements, Book XIII, Proposition 17 (Euclid 300 BC) on construction possibilities packing dodecahedra. Because packing is possible with cubes, the dodecahedron can be truncated so that a cube is left, or the hipped roofs on the cube faces can make the dodecahedron arise. Kepler illustrated the idea (Fig. 18, left) in his Harmonices mundi (Kepler 1619, p. 181). With this idea, a concave solid can be constructed by taking a cube and putting the six, hipped roofs inwards. This concave solid can be used to fill the gaps between the dodecahedra for a space filling arrangement. Caris used this idea for series of reliefstructures (Fig. 19). Besides these more geometric sculptures and reliefs, Caris strove for applications of these spatial packings for housing designs. 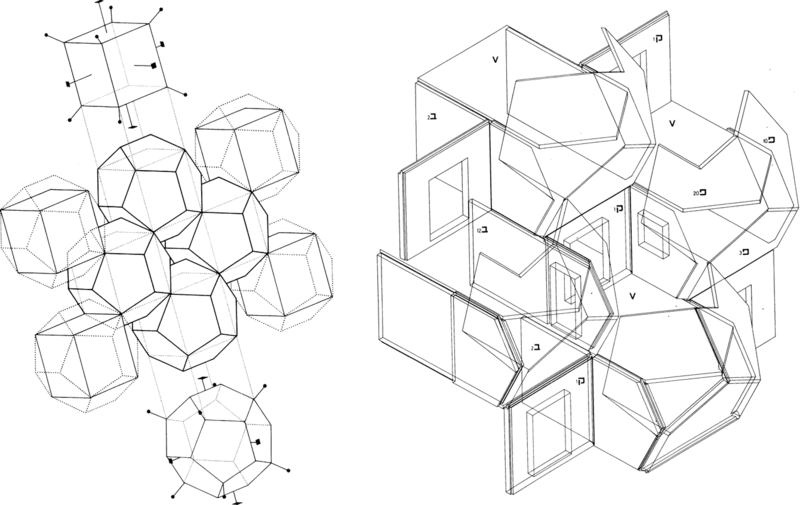 Plates with conceptional drawings by Caris illustrate possible housing creations with the appropriate truncated dodecahedra. The 12-sided dodecahedron and truncation results in the 14-sided tetracaidecahedron shown in Fig. 20. These conceptional ideas led him to experiments with models of such housing or sculptural designs (Fig. 21). Most researchers-architects-students focus on the polyhedral (dodecahedral) elevations of the buildings, but actually the geometric strategy of the project is much more complex. It is related to the form of the site and the phenomena of the Golden Section manifested in the arrangement of seeds in sunflowers and in the geometry of the pentagon. The general plan of the Ramot Housing is reminiscent of the palm of an open hand – its five fingers are retaining walls ‘supporting’ the slope of the hill. Each ‘finger’ is composed again of five boomerang–like buildings assembled in such a way as to create interior courtyards, kind of pedestrian paths reminiscent of the Old City of Jerusalem. The buildings’ inclination towards the interior of the courtyards provides a protected shadowy exterior. The geometry of the buildings follows a stereometric dense space packing of cubes inscribed into dodecahedrons (as dodecahedrons do not pack densely). In this project the elevation pentagons are the smallest in scale elements based on number five. (Hecker 2018). Topological interlocking of convex regular polyhedra has been a subject of recent geometric and experimental research in structural design (Viana 2018a). Topological interlocking is defined as: “Elements (blocks) of special shape [arranged] in such a way that the whole structure can be held together by a global peripheral constraint, while locally the elements are kept in place by kinematic constraints” (Estrin et al. 2011). The topological interlocking of dodecahedra was found to differ in their relation to a tessellation at a half-section of the dodecahedron. The first possibility is deducible from the regular tessellation outlined by their hexagonal cross-sections following Dyskin et al. (2003) (Fig. 24, left). The second is based on a regular decagonal cross-section, also devised by Dyskin et al. (2003; Kanel-Belov et al. 2008) (Fig. 24, middle), and the third, described by Viana (2018b, p. 257), refers to the half-sections of dodecahedra as regular hexagons that tesselate the plane together with equilateral triangles (Fig. 24, right). It seems that Caris also worked on those arrangements of dodecahedra in reliefstructures. The shown reliefstructures in Fig. 25 are similar to TI 2 and TI~3. The Kite-Dart-Gridthat developed out of the Pentagrid led to the Penrose-tiling. The spatial counterpart can be found in the rhombohedra forming the so-called golden diamonds (Miyazaki 1986). There are two rhombohedra necessary for spatial tessellation that corresponds to the types of rhombuses in the plane (see Figs. 9 and 12). They play an important role for aperiodic space fillings in quasi-crystals (van de Craats 2007). In the rhombohedra, the diagonals cut each other in a golden ratio. The rhombohedra can be developed out of the axes of the dodecahedron. The six possible fivefold rotational axes in the dodecahedron, through the faces and the center of the dodecahedron, build the spatial structural grid, or eutactic star (Fig. 26, left). Choosing three of the six axes generates the two different rhombohedra with vertices along these axes. Each rhombohedron consists of six congruent rhombi as faces. Two of each different rhombohedra together form a rhombic dodecahedron (Groß 2007), which can grow into larger rhombic polyhedral spatial structures (Fig. 26, right). 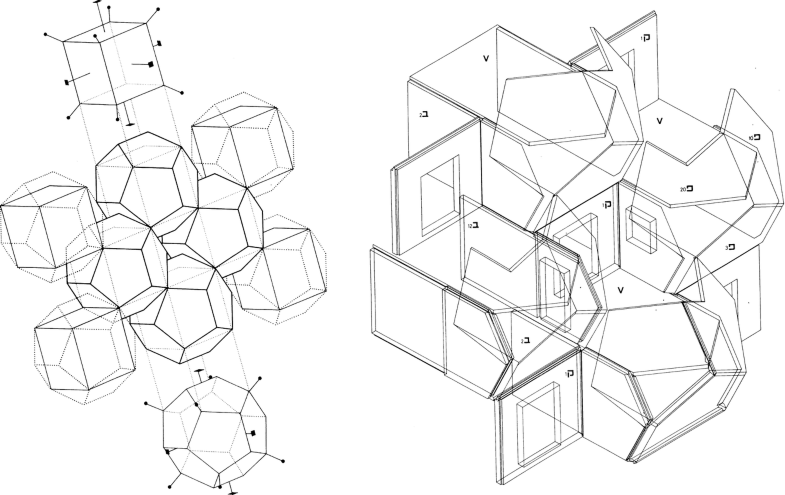 These axes of the dodecahedron enable the dodecahedron to be used as a universal node for the node-edge-model of a related lattice structure (Fig. 27). A hole is placed in the middle of each face of the dodecahedron into which rods can be stuck. This forms a structural node system (Groß 2007). In this way, the relationship between dodecahedra and rhombohedra again becomes apparent. These spatial rhombohedra structures are applied by Caris in various reliefstructures and sculptures (Fig. 28). Are these examples by Caris just geometric models or artworks? This question leads to reflections about the relationship between geometry and art as well as aesthetic categories. As mentioned in the introduction, Paul Valéry compared the role of ornamental drawing in art to the role of mathematics in the sciences. Geometry is the groundwork for ornaments, and the found geometric structures drive explorations in art. However, art cannot be equated to geometry. Artwork gives the chance for aesthetically perceptible, materialized geometric structures. Max Bill (1949) explained in “The Mathematical Way of Thinking in the Visual Art of Our Time” that geometry is the primary element of every artwork, or the relationship of the components on the surface or in space. Nevertheless, geometry and art are not identical. Bill studied the relationship between structures and art. In his opinion, rhythmical order is the creative act of the artist producing an artwork, starting with a general structure. 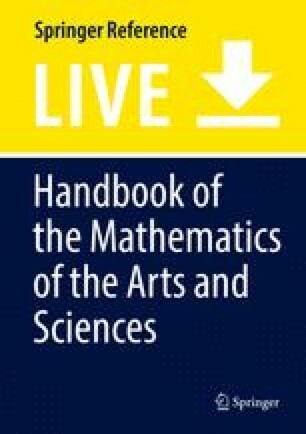 How can aesthetics be substantiated in relation to order structures, rhythm, and as Bill characterized it, in the individual creative decisions that constitute the difference between art and mathematics? Some fundamental assumptions from Information Aesthetics can give criteria for aesthetic measures and evaluations. Information Aesthetics was developed in the 1960s, mainly in Germany and France, as an aesthetic theory on a rational mathematical fundament. The theory was developed by Max Bense (1965), a professor at the University of Stuttgart, and Abraham A. Moles (1966), a professor at the Université de Strasbourg. Today, the term “information aesthetics” is used with a different meaning: the display of huge quantities of data (Nake 2012). Frieder Nake, a protagonist of Information Aesthetics himself, profoundly summarized the theory, its applications, and its critics in his article. Information is seen as the key concept to understand aesthetic processes, and its aim was to create an opposing position to the classical tendencies of aesthetic theory using formalizations (Gianetti 2004). The aesthetic measure of an artwork could be calculated out of order and complexity as numeric quantities. Bense supplemented Birkhoff’s numeric aesthetics with Information Aesthetics. Bense defined the aesthetic state as the relation of an ordered to a not-ordered state. The artwork gives aesthetic information; it is a material carrier of the aesthetic state. Information is always transmitted by signs. Therefore, information theory is based on semiotics, the science of signs for information transmission. Moles (1966) explained the difference between semantic and aesthetic information. Semantic information refers to the meaning of what appears in the message, which is dependent of conventional signs. On the other hand, aesthetic information is how it appears, the way it is expressed, and thus bound to individual signs. The artworks of Caris show us this difference very clearly; they give us aesthetic information. Therefore, the interplay of redundancy and innovation – order and chaos – have to be in an optimal relation to achieve an aesthetic state. Although the goal of information aesthetics to offer totally objective methods for evaluating aesthetic objects has not been reached, these categories of redundancy and innovation remain important for an aesthetic evaluation. The recent developments in art and architecture show more and more complex, asymmetric, and chaotic trends with the tendency to arbitrariness. Often it is even expressed that the artist or architect wants to create complex works. Unfortunately, these aesthetic considerations make obvious that then the perceptibility is no longer reachable, and an aesthetic state cannot be established. Only with the help of redundant order features, which can be achieved by geometric order structures, perceptibility can be reached. More details on the aesthetic theory and the relationship to geometry have been explained by the author in “Prolegomena zu einer geometrischen Ästhetik” (Leopold 2011). By applying these considerations to the art of Caris, we are able to determine that aesthetic states are identifiable by their geometric order, without identifying geometry with art. His presented artwork transmits the pentagonal system by compositions of material elements, in the form of aesthetic information, the way it is expressed in paintings and sculptures as well as individual selections from the repertoire as it is formalized in the Pentragrid. The grid and its three-dimensional version, known as a lattice, is considered as the principle structuring element of reality as well as a leading principle in my personal exploration of art in which an entirely new form of development, self-coined as ‘Pentagonism’, has come into existence. This reveals creations never envisioned before in art, in which an interlinking of art and mathematics becomes self-evident for me and everyone else to see, as well as bringing about an aesthetical appreciation dependent on the prior package of conditioned aspects of the individual. The pentagon evokes its own manifold structures in plane and in space. Compared to the mostly common orthogonal system that is based on the square, the pentagonal system reveals many unique geometric relationships. Through the artworks presented, we can follow the development of the pentagonal system and the related creations of art. The derived geometric structures can serve as fundamental order characteristics in the described meaning of redundancy according to Information Aesthetics. 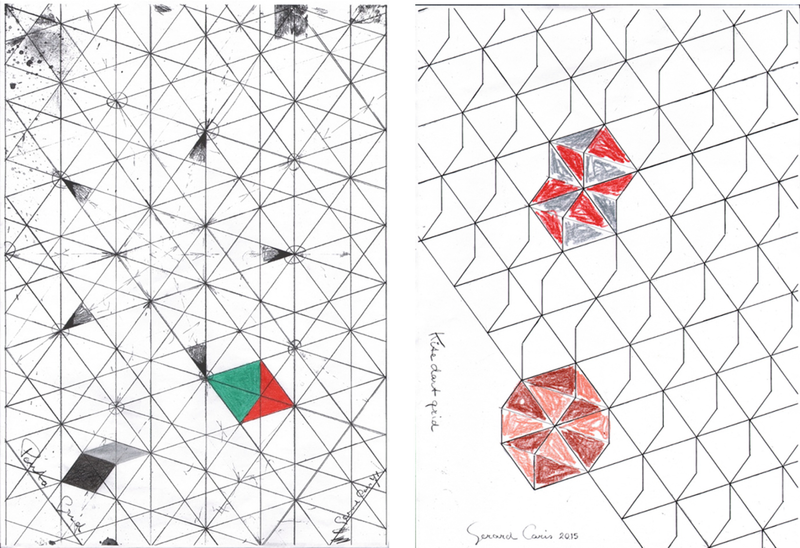 The work of the artist Gerard Caris shows in an extraordinary way how the pentagonal and dodecahedral structures can be a repertoire for so many different art expressions in drawings, paintings, and sculptures, each with its aesthetic information. It is apparent that neither geometry nor mathematics can be directly identified with art, but aesthetics and mathematical logic merge together for Caris. The analysis of pentagonal and dodecahedral structures goes back to the early history of geometry (i.e., Plato, Euclid, Dürer, and Kepler), but still today new relationships have been found in recent research. Monohedral tiling with convex pentagons or topological interlocking of dodecahedra, for example, is a new research topic connected to advanced digital possibilities. Caris’ art expresses the stimulating role of geometric structures in the creation processes. The viewer of his works can take part in his structural thinking processes, which are visualized in methodological tools like the Pentagrid, for example. The manifold surprising and fascinating patterns as well as the spatial configurations in Caris’ art juxtapose innovation and redundancy, a balance that guarantees perceptible aesthetics. Many thanks to the artist Gerard Caris for the opportunity to visit him in his atelier, showing and explaining his work to me, and allowing me to get an inside view of his creation processes. The images of his works of art in the figures here are used with his kind permission, and they are managed and supported by VG Bild-Kunst, Bonn. I am grateful to Margriet Caris for helping me with all of my questions and requests. Thank you to Zvi Hecker, who agreed to allow the use of his drawings and photos of Ramot Polin housing project to explain his design background. Finally, many thanks to Vera Viana for her discussions on the relationship of recent topological interlocking research and Gerard Caris’ respective artworks, as well as for creating the drawings/renderings in Fig. 24 for this paper. Thank you also to Jasmine Segarra for proofreading this chapter.